Instructions: To view a larger image of this project, see here. Cut the die 4 times out of Creme cardstock, use the flower insert in all 4 pieces to cut the flower window out, after that you can cut 4 pieces of the vellum and glue this behind the windows. Now you can glue the box together by putting dries clear glue on the tabs, when the box is done you can Ink all the edges with the Vintage Photo ink. Cut out 4 times the little top part from pattern paper and ink this too with the same ink and glue the pieces on the top part of the box, You can also cut a strip of pattern paper for the bottom and the top part. 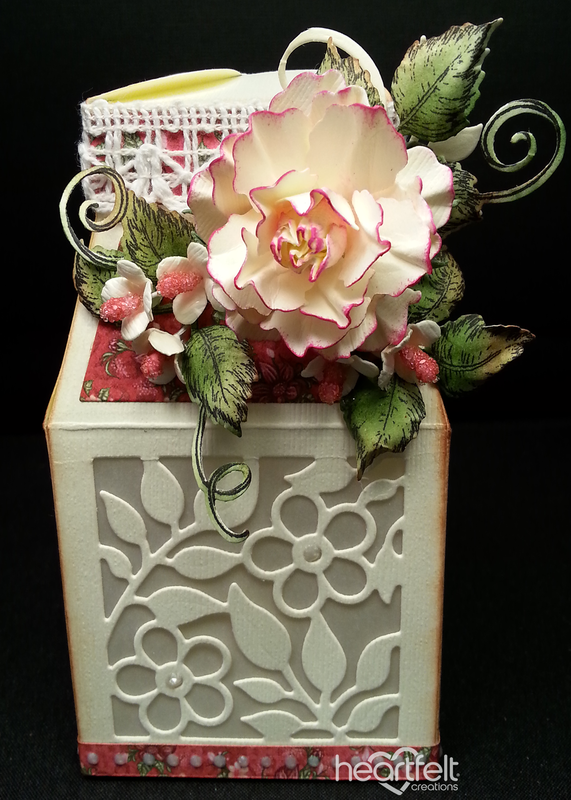 Put a piece of lace all around the top part, put some dots with the pearl pen on the window Flowers and on the bottom design paper strip, stamp the rose vines with the Versafine black and color them with a mix of New Sprout and Bamboo Leaves and Vintage photo, Cut them out with the coordinating die and glue this on top of the box. 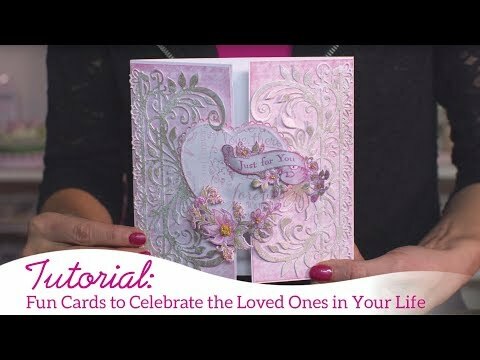 Now Stamp 5 Big Rose petals with the classic rose stamp set using Rhubarb Stalk ink and cut them out with the coordinating die, wet them with a spray of water and shape them with the deluxe flower shaping kit. After each petal you color the rose on the back with the Rose Bud. 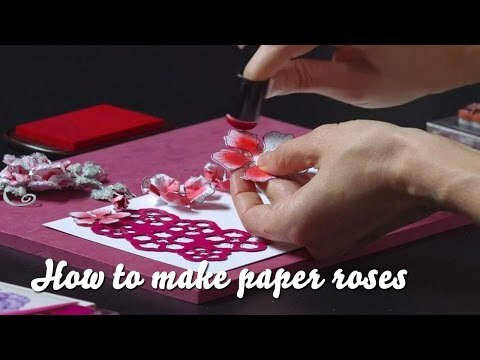 Color very lightly and when the rose is done you can put some Rhubarb stalk ink and Ink the edges of the rose to make it darker, then you can glue them on top of the rose vines. Stamp with Rhubarb Stalk some flowers of the window box fillers on creme cardstock and cut them out with the coordinating die, I didn't color the flower itself, now shape them with the shaping kit, make a hole in the center and put a flower stamen in, now you can glue the flowers next to the rose.